Yes. On the Dawnguard side until Kindred Judgment, on the Vampire side until The Bloodstone Chalice. 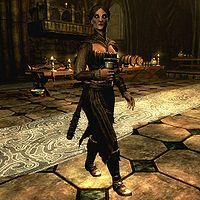 Salonia Caelia is an Imperial vampire in Volkihar Keep. Salonia wears a set of black vampire armor with a matching pair of boots. She is equipped with a leveled one-handed weapon which can be up to elven quality. She carries random leveled bandit loot, as well as a 25% chance of carrying 1-9 gold. They will become hostile at this point and attack you and each other. The Bloodstone Chalice‎: Fill the Bloodstone Chalice from the Bloodspring at Redwater Den. This page was last modified on 8 February 2019, at 15:35.